Taiwanese President Tsai Ing-wen on Wednesday assured her people that her administration would never move toward conflict with mainland China at the spur of the moment, but that she would defend at all costs the democracy enjoyed by the 23 million Taiwanese. In her Double Ten National Day speech, Tsai called on China to act as a "mature" nation to assume "a responsible role" in the region rather than trying to boss around self-ruled Taiwan. Tsai did not mince words against her mainland counterpart Xi Jinping's sharp-elbow tactics – from sanding bombers and spy planes to intrude into Taiwan's airspace to luring away the island's diplomatic allies – as the most grave challenge to peace on both sides of the Taiwan Strait. "Some might demand a tougher stance from the government, while others wish for greater compromise, but Taiwan's best course is to maintain stability in times of radical change, to face China's pressure with equanimity and find a niche for survival," said the president, adding that her stance and gauge of the situation were also based on the consensus of the public. The way for Taiwan to survive and prosper would be to become an even more indispensable part of the global economy and community, according to Tsai. She also stressed that her administration would never accept any unilateral attempt to change the status quo, and any claim contravening universal values would never be supported by the international community. Observers say Tsai has taken an even tougher stance against Beijing's headstrong approach to tame her Democratic Progressive Party (DPP) and her administration. While tacitly admitting that the island had no capability of challenging the mainland, Tsai has also stated the resolve to rise up to Beijing's bullying, especially as Washington has also moved to contain China both in trade and through potential shows of military force. Tsai devoted several paragraphs in her speech to improving Taiwan's defense capabilities through a multi-pronged strategy, including increasing the defense budget, countering disinformation, and seeking defense cooperation with the US. 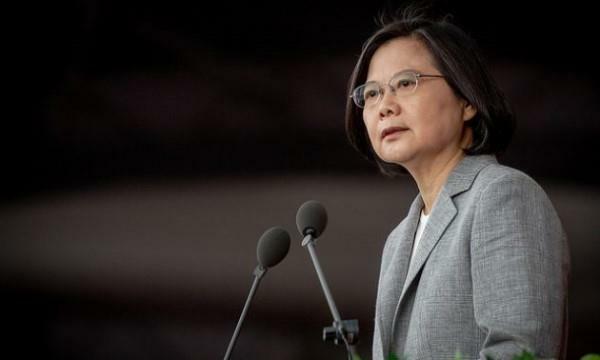 Tsai also said she hoped the people of Hong Kong and mainland China could be inspired by Taiwan's democratization. This year's National Day marked the 107th anniversary of the establishment of the Republic of China, Taiwan's official name. Leaders from Paraguay, Saint Kitts and Nevis and Saint Lucia were among the foreign dignitaries who attended the event. In Beijing, the Chinese State Council's Taiwan Affairs Office blasted Tsai's speech as full of "separatist nonsense and antagonist thinking" against the mainland, and retorted that Tsai's party, the ruling DPP, was the destroyer of peace. Tsai's fawning toward the US partially resulted from the loss of several diplomatic allies this year, a research fellow at the Chinese Academy of Social Sciences' Institute of Taiwan Studies told the Beijing-based Global Times. The researcher alleged that Tsai had been seeking to exploit the growing rift between Beijing and Washington to her own advantage, and that since Taiwan had "dragged the US into cross-Strait relations," the mainland would only respond by pressuring Taiwan with more frequent military postures and drills targeting the island.